The Green Climate Fund: will the vulnerable be overlooked in a rush to spend? As the Green Climate Fund's board meets to decide on a second round of spending it needs to prioritise initiatives that will reach the climate vulnerable, rather than large-scale business as usual investments. The Green Climate Fund (GCF) board will meet at the end of this month in Songdo, South Korea (28-30 June 2016) to select from a pipeline of projects and programmes to reduce carbon emissions and build climate resilience in developing countries. But given the small number of projects allocated funding so far and the length of time to disperse the money, the GCF is under growing pressure to spend the targeted US$2.5 billion of its $10.3 billion pot by the end of 2016. This gives rise to concern that conventional large-scale infrastructure projects will be prioritised over smaller, decentralised, innovative solutions benefiting people living in poverty, such as off-grid energy services for rural communities. The GCF board must take bigger risks, supporting entities that can channel funding to reach local communities and build capacity among institutions so they are agile enough to integrate climate and development initiatives. A new report by IIED and HIVOS – which crunches more than a decade's worth of data on how far international public climate funds are targeting decentralised energy access – shows this risk of skewed spending is all too likely. In the energy access sector, policy and investment is still far too focused on large-scale grid extension, rather than the myriad of small-scale off-grid and mini-grid services that are often quicker and cheaper to deploy (PDF). Looking at the eight projects approved so far worth $170 million, and those being considered in the upcoming board meeting worth $207 million, how far has the GCF delivered its promise to invest in innovative, smaller-scale activities that bring real benefit to those hardest hit by the impacts of climate change? 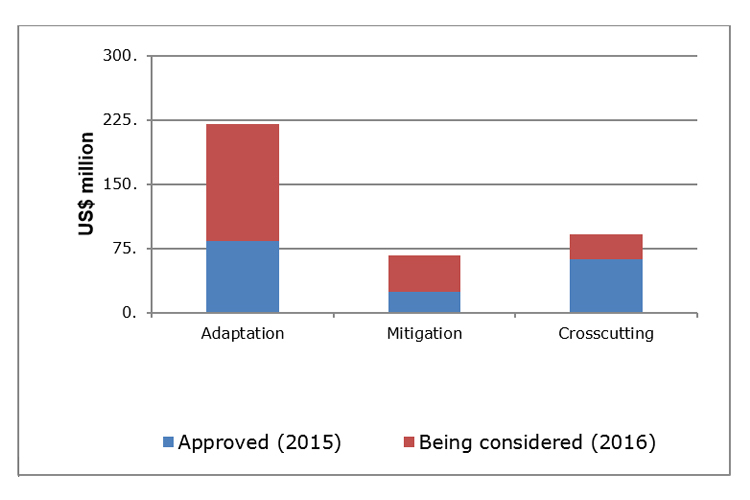 Most projects approved in the last tranche and those being considered in the next round focus on adaptation. This sends an important signal that funding is being allocated both to projects helping countries adapt to climate change and those reducing greenhouse gas emissions. 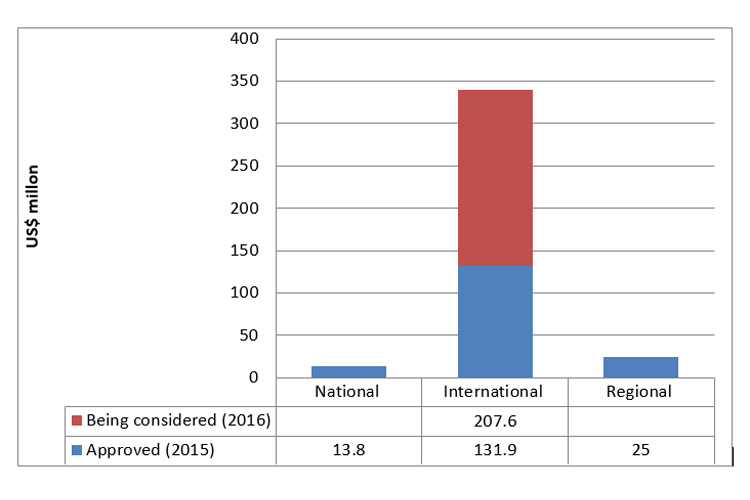 Almost half of the projects signed off in 2015 were approved for Least Developed Countries (LDCs) and Small Island Developing States (SIDS). 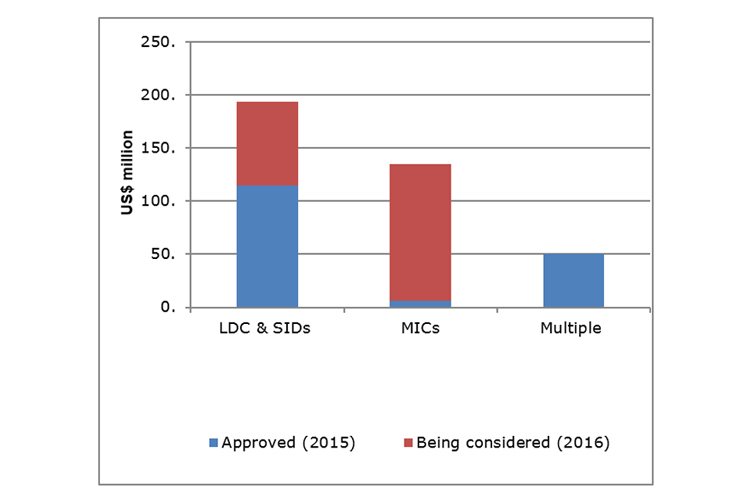 Although there are more projects from Middle Income Countries (MICs) in the upcoming tranche, the total share for LDCs remains relatively high. This is a welcome trend for these vulnerable countries as most international climate finance to date has been allocated to higher income countries or MICs. Most funds still focus on large-scale investments rather than local community projects; sub-national priorities once again remain on the decision-making fringe. This trend prevails in energy projects. A quarter of projects considered for the next round focus on building energy systems that are more efficient. Efficiency is important, but it is striking and worrying that only one of the projects cover decentralised renewable energy investments. Other climate funds show the same pattern. The Climate Investment Funds (CIFs) and the climate strategies of multilaterals development banks focus on large-scale investments through bigger funds such as the Clean Technology Fund (CTF) in the MICs. These overshadow small-scale community-focused investments. 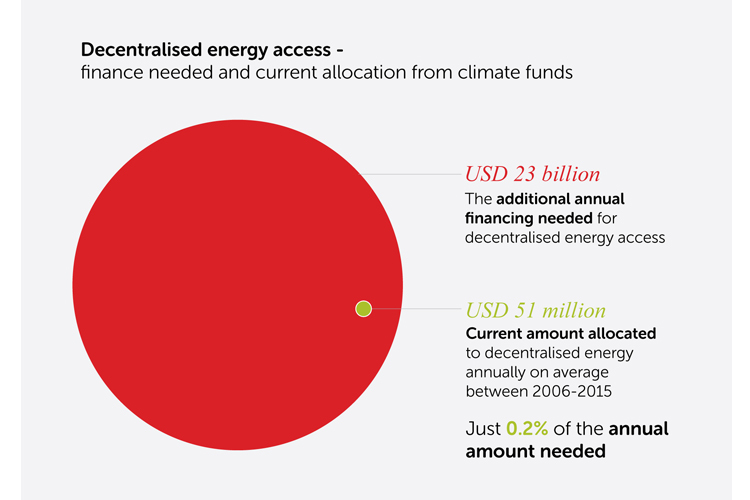 The IIED and HIVOS report shows only three per cent of international climate funds have targeted decentralised energy projects, compared with 40 per cent of funds going to the energy sector, most of which are being spent on large-scale grid-based electricity in MICs. The International Energy Agency (IEA) estimated in 2011 that an additional $23 billion per year is needed for financing decentralised energy. Yet our number crunching found that international public climate finance channels an average of $51 million a year – or just 0.2 per cent of what is needed. 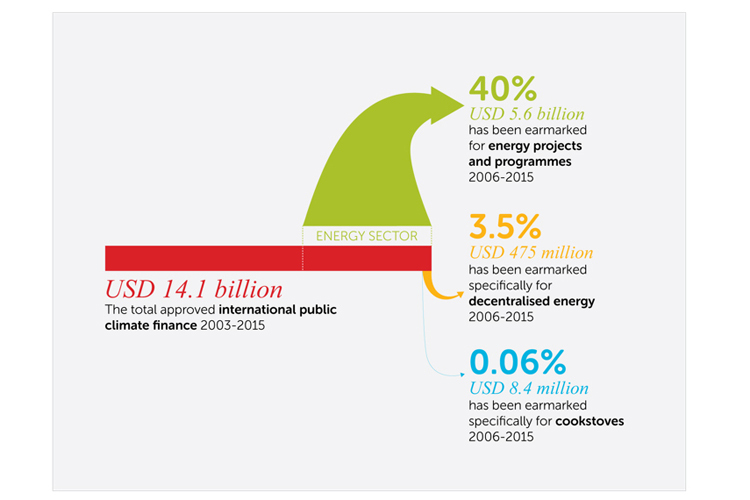 Climate finance can't fill all the funding gaps, but it surely can do better than this? While there is a clear need to engage national and local agencies that are closer to communities most vulnerable to climate change, the majority of projects are being channelled through international agencies. Of the GCF's existing projects, almost 90 per cent of spend is through multilaterals like UNDP, World Bank and Inter- American Development Bank, rather than national or regional agencies. A further three-year extension of the CIFs announced last week (subscription required) in Mexico will accentuate this trend of bulk funding through multilateral development banks. A forthcoming IIED report by Soanes et al (2016) emphasises how the current international financing architecture meets the demands of powerful international funding agencies but restricts access for local projects that safeguard the poor and vulnerable. What's stopping funds reaching small-scale projects at the local level? There are many barriers and much comes down to national policy frameworks and capacity. To take the decentralised energy example, unfavourable rules or subsidy regimes, or lack of proven business models, slows down public investment. But there are also specific problems with the climate funds themselves. Financial credibility, co-financing requirements and risk appetite of funds: Several climate funds, including the GCF, require agencies to prove that projects are able to raise additional finance. The funds also require projects to be within tolerable levels of risk to survive potential losses. Local level projects are often riskier than larger, business as usual investments and unable to meet these stringent criteria. Using preparatory funds, including grant funding, to help country governments reform policy frameworks, build institutional capacity and develop healthy pipelines and proposals that benefit local communities. Neha Rai (neha.rai@iied.org) is a senior researcher in IIED's Climate Change research group; Sarah Best (sarah.best@iied.org) is senior researcher in IIED's Shaping Sustainable Markets research group. This post originally appeared on the news website of the Thomson Reuters Foundation. Can blockchain unblock climate finance?